Some parents might be overwhelmed by today’s high tech toys and video games, but they’ll be happy to know that some classics never get old, they get better. Over the years since our childhood toy makers, custom builders and designers have improved on simple toys like the humble rocking horse. Now you can find motorcycle rocking horse toys that not only rock, but rock out loud! Check out these amazing motorcycle rocking horses. 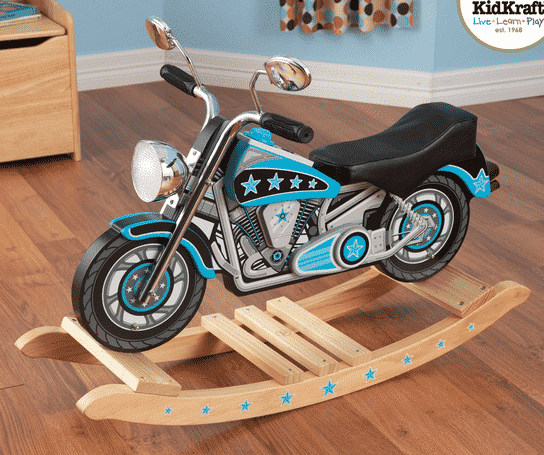 The KidKraft Star Studded Rockin’ Motorcycle is one of the most modern and cool motorcycle rocking horses available. Although it looks like it is made from steel and chrome it is actually made of wood, with very delicate designs. Assembly is simple if you follow the instructions. It is a great kids toy for children below 3 years old. 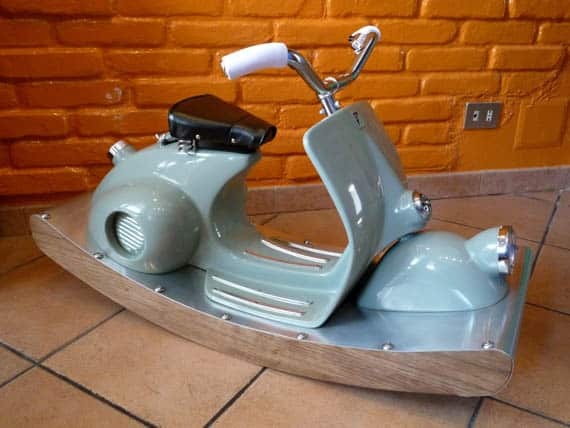 If Italian scooters don’t do it for them, maybe your children would rather rock on a real hog. 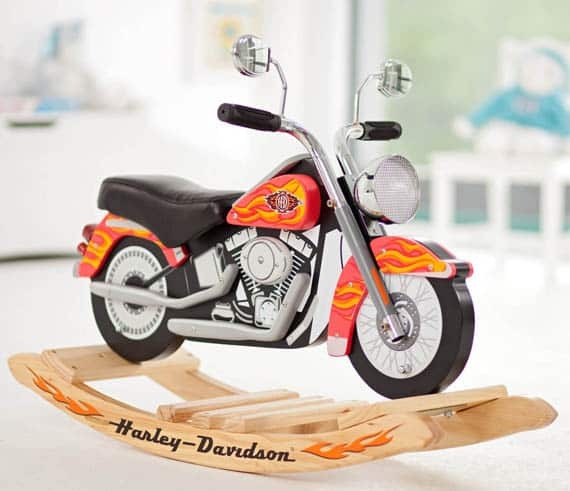 Created from durable high-quality wood, this Harley Davidson rocking horse features a black leather seat and genuine Harley Davidson graphics. The Cute decals and well-crafted design give this rocking horse a nice custom look. Your children will be ready to rock at play time! 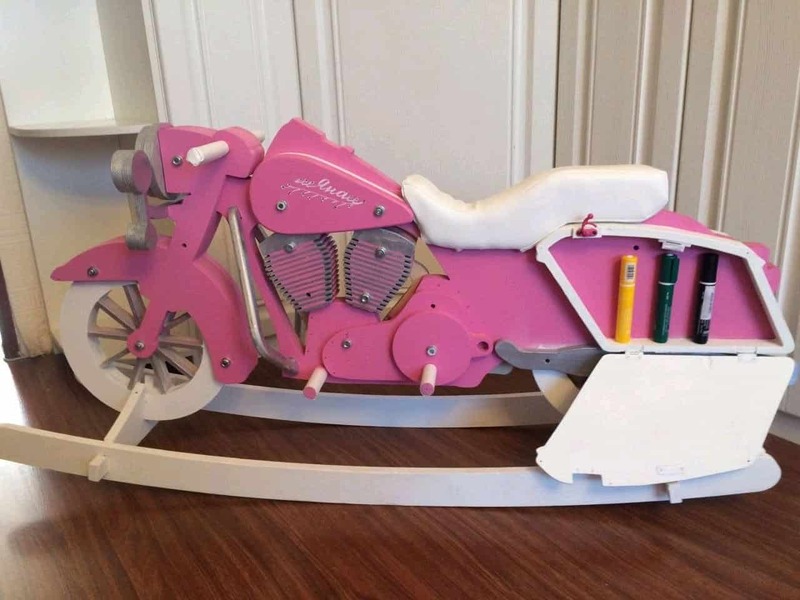 Break the stereotypes with this pink Harley Davidson rocking horse. Suitable for being in the house, this rocking horse is made from safe and environmentally friendly materials, it has a soft seat for comfort and non-slip handlebars. The bike also comes with a side compartment for your child to store soft small items like pens or a notebook. One important note to add that we found out when contacting the owner, if the colour pink isn’t for you, this motorcycle can be ordered in unpainted form for an additional saving. 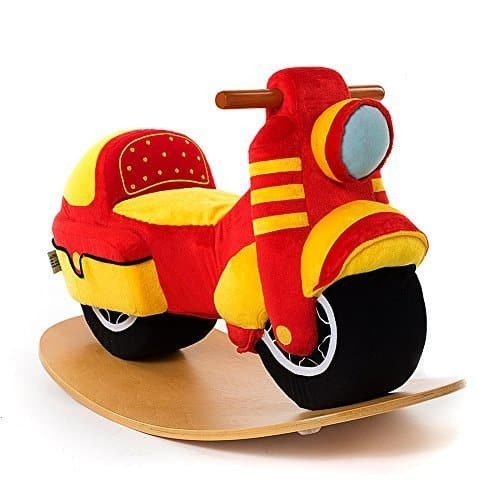 This comfortable plush motorcycle rocking horse comes with a large wooden base, making it extra stable for your child. All the corners are rounded too providing extra safety. This makes a suitable toy for ages 2 to 3 years old, this popular plush fabric rocker is sure to be a popular choice! It’s as cool as a Harley Davidson motorcycle rocking horse at a much lower price with added protection. Soft, comfortable, and stylish, it’s the perfect gift for small kids that want to play in style. 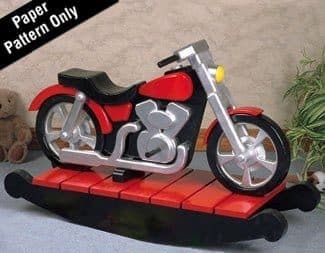 Made from 100% natural Oak, this motorcycle rocking horse is well-designed and handmade by Amish craftsmen in the heart of Pennsylvania’s Amish Country. It has a superior durability for heavyweight and wear. This motorcycle rocker comes fully assembled with a cushioned leather seat and rounded edges for safety. With its stylish wooden look and high build quality, this rocker will stand the test of time. Here’s a rocking horse that would make any adult jealous! The Rocking Vespa Scooter not only looks like a real Vespa Scooter, but features working lights and a horn. 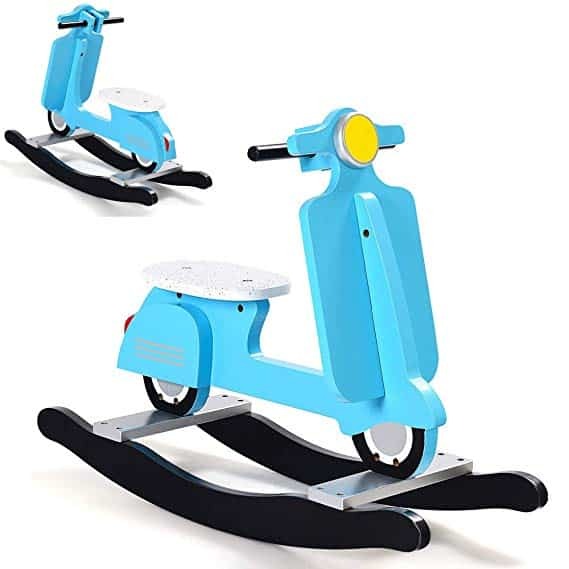 If you have a lot more to drop on a rocker, your toddler can pretend to ride through the streets of Italy in style. Looking for a cheaper Vespa rocking scooter alternative? 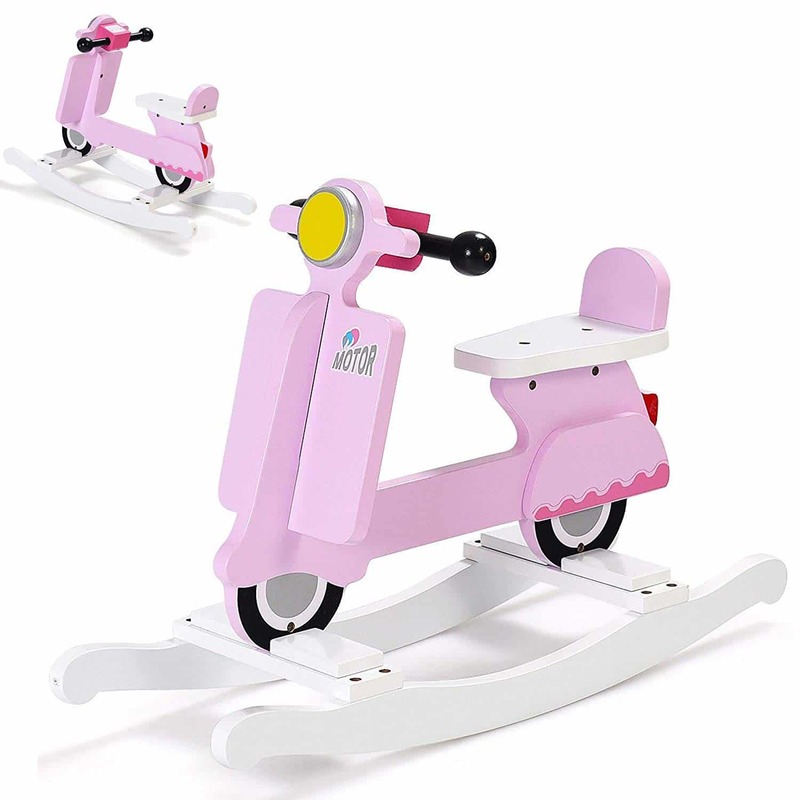 Below are two popular wooden Vespa rocking horses we have chosen based on their popularity. 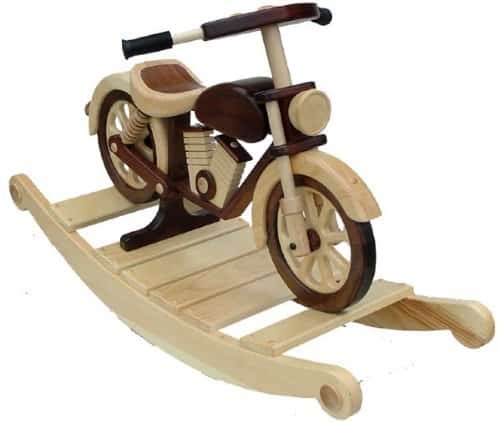 Fancy building your own wooden motorcycle rocking horse? Well, now you can. Get this full-size paper plan with a step-by-step guide on how to make one from home. This classic style Rocking Motorcycle design is very unique. This motorcycle rocking horse plan is suggested for medium or advanced level woodworkers, but if you’re just starting out, why not take it on as a challenge? This product does not come with any materials, just the plans. There seems to be a correlation between rocking horses and motorcycles. 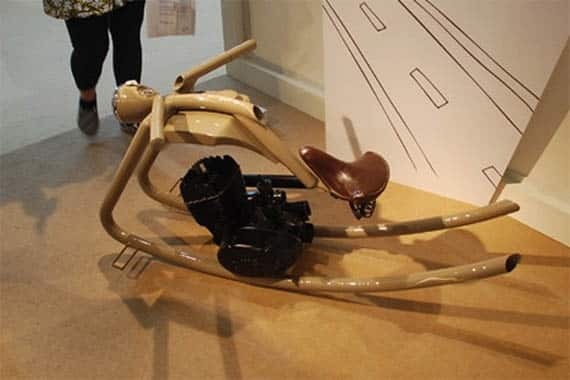 This custom motorcycle rocking horse includes an engine and headlamp so your toddler can really vroom! Best motorcycle rockings horses for kids on the market in 2019. 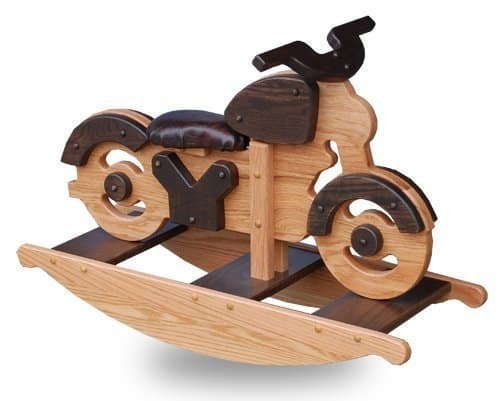 See them on a Harley Davidson rocker, or build your own with some wooden rocking horse plans!